Reduce wear and tear on costly cutting tools with the Machinist Calc Pro 2. This advanced machining math calculator includes materials and tool settings combined with DOC and WOC to solve all your speed and feed calculations for face, end or slot milling plus turning, drilling and boring. It has built-in tables for 20 materials, six processes and three tools (High Speed Steel, Carbide and High Performance). It also gives you step-saving drill and thread chart look-ups, right triangle solutions, bolt-circle patterns with center x, y coordinates; Drill Point Cut Depth solutions, wire sizes and 3-wire measurements, a larger 2-line LCD display and much more all built into a portable, rugged and cost-effective handheld calculator. Built-in functions include calculations for feeds and speeds (including cutting speed, spindle speed, cutting feed, feed per tooth/chip load, and more); and trigonometric functions. Additionally, you can enter numeric, fractional, and metric thread sizes and drill sizes to display tap, roll tap, close and free fit drill sizes plus pitch, and major and minor diameters. The Machinist Calc Pro 2 is built for efficiency-minded machinists, setters, tool-and-die makers, supervisors and shop owners in small to mid-sized machine shops who want to increase shop productivity and profits in the design, layout and set-up stages of production. The MCP 2 is a dedicated handheld machining math and reference tool that provides a complete assortment of essential machine shop solutions and time-saving tap and drill charts that can dramatically increase users' calculating power, eliminating wasted steps and saving time. 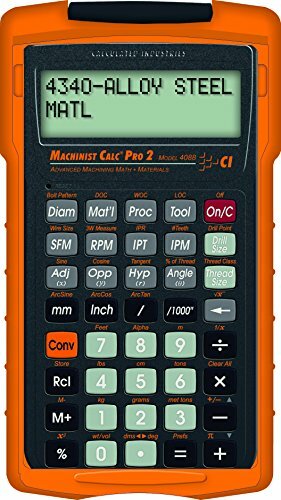 It also works as a standard math calculator, converts between U.S. and Metric Units, Feet-inch-fractions to 1/64ths, decimal inches and mils, meters, centimeters, millimeters, pounds, tons, grams, kilograms and metric tons, area, volume and weight.